It is with love in my heart that I write this blog post to you, my amazing readers. Nine years ago I had a crazy idea. I was going to write a blog. And not just a family blog, which was all the rage at the time, but one that explored other areas of my life, including my profession. For years, other mommy bloggers read my posts and commented. They thought it was so interesting to learn about speech and language development. They laughed a little with me, and I read their posts in turn about their kids and their pets and their lives. And then, so long ago I can’t even remember, a speech pathologist or two started reading my blog. I only knew it had happened because someone wrote a comment on a blog post. After recovering from my initial shock, I realized that there were SLPs on the web that wanted to read about our profession — the good, the bad, and the ideas of others. And that, my friends, is when my creative spirit soared. Since that time, I have gone from an adamant non-writer (in fact, I haven’t taken an English class since 12th grade), to someone who has written almost 700 blog posts. I went from a non-creative to someone that now thrives on thinking outside of the box. I have been transformed by this blog. And by you. Your comments and emails are what keep me going. I am not writing in a vacuum. I have made friends. I have taken trips. I have spoken at national conferences. To you and with you. I am forever grateful. As a small token of gratitude, I have two $25 TPT gift cards to giveaway. If I could give everyone reading this a hug as well, I would. Contest ends 1/31/17. Good luck! Thanks for the oportunities to put my name in the hat. Love your ideas! Happy 9-aversary! Thanks for sharing great ideas, humor, and encouragement. Congratulations! I love all the great resources! Thank you so much for your fresh ideas and your hard work. It’s clear that you put a lot of time into your products. My favorites are the ones that can be used seamlessly across the caseload such as the Language HW for the Year! Thank you for your time, ideas, resources, honesty and candor…and congrats on your 9th anniversary. I look forward to seeing what the next 9 years will bring. Love your posts and products! Thanks for a chance to win!!!!! Congrats on this accomplishment!!! You’re awesome! 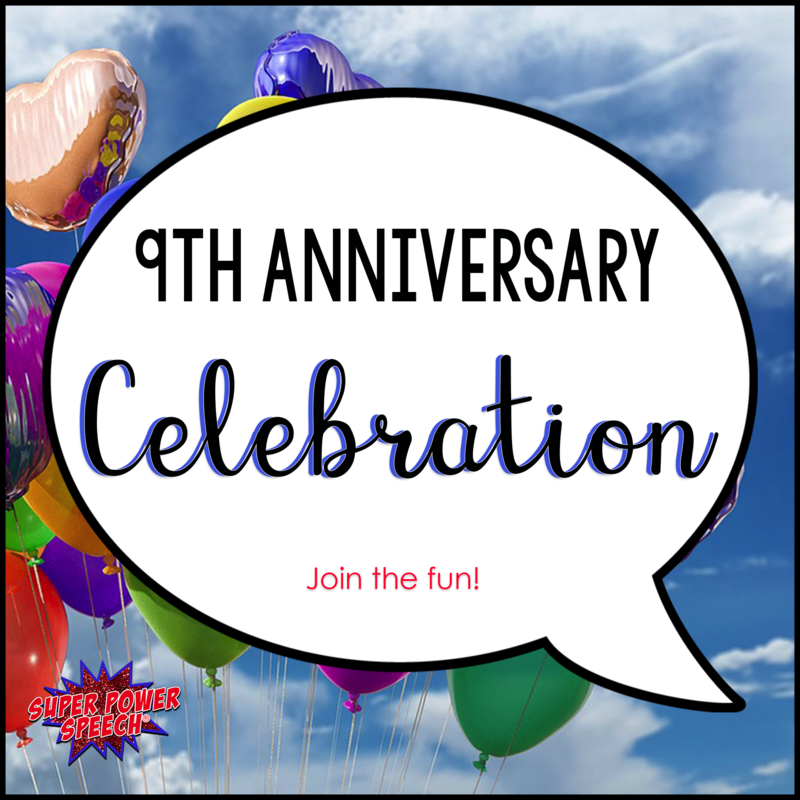 Congratulations on nine awesome years!